Our services are tailored to meet the needs of companies that need to get traction during periods of strategic transition. We use processes that are focused and fast so that you can begin seeing results as quickly as possible. Our goal is to help you identify and implement the right strategy as quickly as possible. Your specific situation may require some tailoring of these Services. 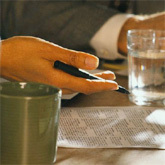 All of our clients have a core business plan in place. And most have operational plans in place as well, including product plans, sales plans and marketing plans. A significant inflection point requires companies to re-think these plans, either to change direction or to make the current direction more effective. 2. How should the customer base be segmented? 3. What is the specific problem that the company is trying to solve with its products and services? 4. What is the winning value proposition that the company provides the customer? 6. How should the company position itself against its competition for customers, analysts and press? . We realize that your company has already invested in a great deal of productive work on these issues. We begin the Strategy Blueprint work by reviewing where you are, what you have learned, and how effective your strategies have been. Using this information as a base, we validate the ideas and tactics that have worked well to date. We then look more broadly at the market, customers, the competitors, the analyst community, and the financial community to propose the one or two possible directions that offer the greatest probability of success and the best ROI. We conclude the Strategy Blueprint by providing our recommendations for product and market strategy, including positioning. Our experience has shown that one of the most valuable aspects of the Strategy Blueprint work comes from our external perspective. Because we have not been involved in previous decisions or the "politics" of the organization, we can provide unbiased guidance and insight. 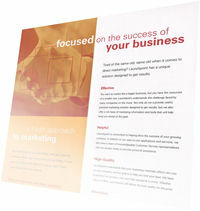 The Strategy Blueprint serves as the foundation for bringing your company or products to market. 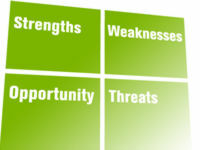 The next step is to translate this baseline strategy into specific marketing objectives. First, we assist in defining the core marketing specifications, including company positioning and messaging. Other core marketing specifications may include product/service positioning and messaging, taglines, branding and naming. The core marketing specifications are used as the basis for every marketing activity that follows. Clear and consistent marketing creates the greatest possible impact on customers, press, investors, and analysts. It takes focus, insight, and creativity to create a compelling brand. Next, we create a marketing plan based on your budget and your broader objectives. Given your decisions regarding product mix, revenue, and profitability, what kind of marketing makes sense? Should you just focus on a website and forgo brand marketing for now? Should you develop sales support tools and deploy telemarketing and direct marketing resources? What will produce the best results in the shortest amount of time? Bringing a product or service to market after a significant inflection point represents a rare opportunity to generate widespread excitement among customers, analysts and press. Because a notable launch to market can't happen more often than every year or two, you'll want to get all the leverage you can from your investment. What's the secret to a successful launch? Having a consistent presence in the market across all media makes a big difference in how your company will be perceived. Getting the attention of the right analysts and press is critical. Creating successful customer or beta-site stories is indispensable. We orchestrate the work of internal and external creative and technical marketing resources to achieve results, whether the goal is a full-scale launch or an "under the radar" briefing. We leverage the resources you already have in place - employees, agencies and/or contractors - and we bring in the other help you need quickly and efficiently. Unlike a traditional consulting company, we don't just put a stack of PowerPoint recommendations on your desk and leave. We help you build momentum in the right way to achieve your goals. © Copyright 2001-2011, Jumpstart Ventures LLC. "Jumpstart Ventures ®” is registered in the U.S. Patent and Trademark Office. All rights reserved.